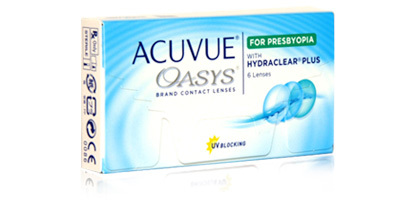 If you find it hard to focus on fine print close up and read signs in the distance, Acuvue Oasys for Presbyopia contact lenses can solve both problems in one hit. Now you don’t have to carry two pairs of glasses around and constantly swap between the two. One lens can do the job of both just as effectively. Recommended for those in their 40s and 50s, these multifocal contact lenses offer excellent acuity of vision in all light conditions. Whether you’re sat in front of a computer screen in an air conditioned office, working out at the gym or driving at night, Acuvue Oasys for Presbyopia lenses will stand up to the task. Johnson & Johnson are pioneers in the field of healthcare, so you can be sure that eye health will be supported to the highest level. 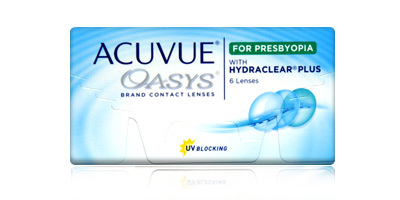 In fact, Acuvue Oasys for Presbyopia lenses offer better levels of UV-A and UV-B protection than most two weekly disposables. Sophisticated Hydraclear technology allows you to wear these contact lenses for longer than average periods without experiencing discomfort or blurred vision. Wear them on a daily disposable schedule for up to 14 days or on an extended wear basis for six nights on approval from your optician. A highly wettable moisturising agent and a soft, super smooth material make for a very natural lens wearing experience. Described as the next generation of multifocal lenses, Acuvue Oasys for Presbyopia lenses combine comfort and durability with exceptional vision quality and eye health benefits. Whether you’re thinking of ditching glasses or are struggling to manage with a single-use lens, these lenses could be the answer to your problems. 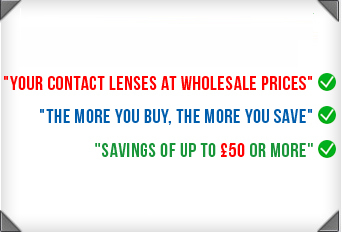 Call freephone 0800 037 4000 for advice on any of the products featured on Contact Lenses Express.